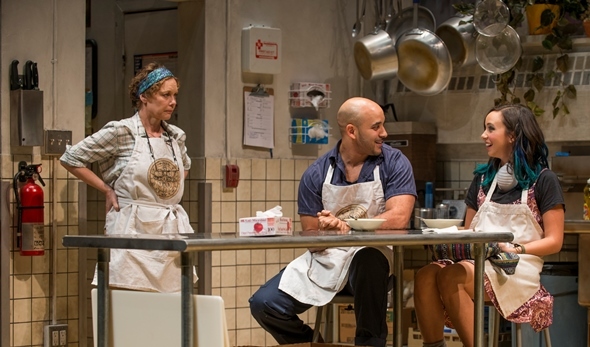 The fascination of Heidi Schreck’s play “Grand Concourse,” now at Steppenwolf Theatre, lies not so much in the personal crisis of a nun whose faith is wavering as it is in the human response of a good person directly affected by unmitigated evil. That moral dilemma keeps us hanging on through the last syllable, or rather sigh, of this well-made drama. 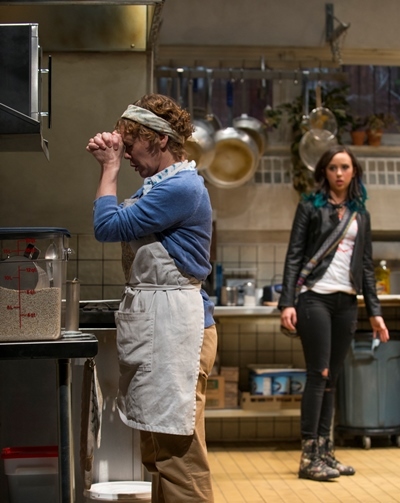 Shelley, the nun, runs a soup kitchen with help from Oscar, a young Latino whose main duty is to act as enforcer when the clientele get too rowdy. One day Emma, about college age, shows up wanting to help as a volunteer, to feel like she’s doing something worthwhile. She seems a little edgy, but Shelley welcomes the extra hands. It isn’t long before Emma blurts out the reason for her flaky behavior: She has cancer. 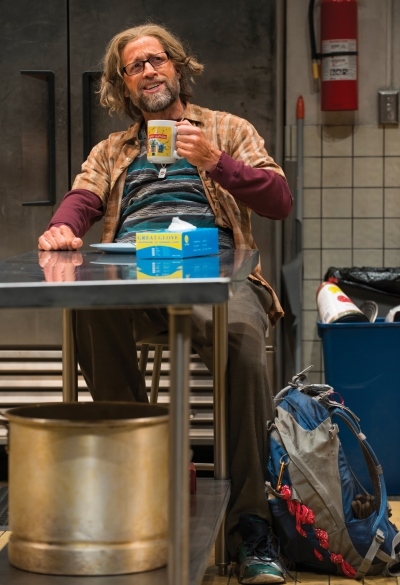 That’s the setup, and daily life in the soup kitchen – appointed in realistic detail by designer Joey Wade – moves forward with something like the routine of hard work and good cheer you might expect. We never see the dining hall or the indigent patrons, except for a regular called Frog, who wanders into the kitchen from time to time, only to be hustled out by Shelley, with an occasional assist from Oscar. But beneath the surface routine, the stream of life is roiled by distress. Though she has been a nun for a long time, Shelley (Mariann Mayberry in a gritty, honest performance) is questioning that choice. She has even lost her ability to pray with a devout, open heart. In a sort of reconditioning program, she regularly prays in front of the microwave timer in hope of working up to longer stretches. It’s a darkly funny bit, but the truth is that Shelley is seriously trying to find herself, and deeply troubled by her ebbing piety. And now she’s about to face a severe test. Emma (Brittany Uomoleale) begins to display acute behavioral swings, from vibrant and collaborative one moment to angry and distant the next. She makes an overt sexual advance on Oscar (played with show-stealing warmth by Victor Almanzar) that has lasting repercussions on his relationship with his girlfriend. Emma is very hard to figure – up to a point anyway. And then she comes round, begs forgiveness and plunges back into the soup kitchen effort with new enthusiasm and creativity. The girl even helps shambling, goofy, hotly temperamental Frog (a lovable fool in Tim Hopper) get himself together to find a job. Uomoleale is quite convincing as this kid who has seen the light at last, seized her chance at redemption and, well, grown up before our eyes. Until Shelley makes a stunning discovery, and the girl’s psychological pendulum takes a devastating swing back to the dark side. At a time of great trust, Emma commits a mortifying betrayal that leaves Shelley shaken to her core and kind-hearted Oscar just sure that there must be some mistake, some explanation, something that will qualify the hideousness of what apparently has happened. But Shelley is inconsolable – which leads to the playwright’s most inspired conceit: Frog wanders in looking quite lost and tense, and Oscar, who knows Frog’s hot buttons, hits upon an idea to bring Shelley out of her self-absorbed sorrow. Suffice it to say Oscar’s gambit works. What follows is at once a touching image of pietà between Shelley and Frog, and a dramatic red herring. Indeed, over the last long stretch of “Grand Concourse” – named for the street in New York on which the soup kitchen is located — one is never quite sure which way the narrative is going to turn, or even whether it’s at an end. I confess to thinking the play was finished at about four different points – always on an upbeat. 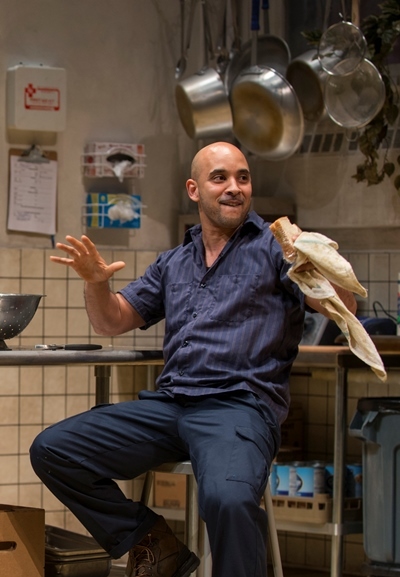 But “Grand Concourse,” directed with equal parts of humor and gravitas by Yasen Peyankov, does not end on a high note. It ends in limbo, though Shelley’s life looks somewhat clearer than it did at the start. And Emma, dear demonic Emma? She’s sorry — really, really sorry. Note: Tim Hopper continues in the role of Frog through Aug. 9; Francis Guinan will play Frog from Aug. 11-30.